Comply with NCAA and NAIA rules to avoid problems. Students love high school athletics. They want to keep the fun going in college. Many families hope athletic success in high school will lead to scholarships and even careers. 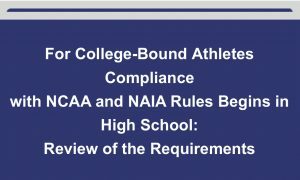 National Collegiate Athletic Association (NCAA) and National Association of Intercollegiate Athletics (NAIA) rules affect high school athletes starting in their freshman year of high school. If they do not comply, they may not be eligible to participate in college sports. What are the NCAA and NAIA requirements for high school athletes? What are the differences between the NCAA and NAIA? How can you determine a student’s best fit at a Division I, II, III, or NAIA school? How should high school recruiting rules be applied? What are the GPA and SAT/ACT requirements at NCAA and NAIA schools? Are there differences between traditional and non-traditional courses? Julian Beckwith will explain NCAA and NAIA step-by-step, so you can ensure your athletic programs enable participants to thrive in college.